Christmas Cookie Gifts Delivered. 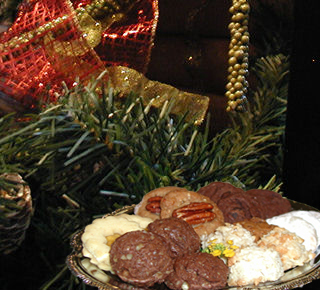 Buy Online Christmas Cookie Gifts. 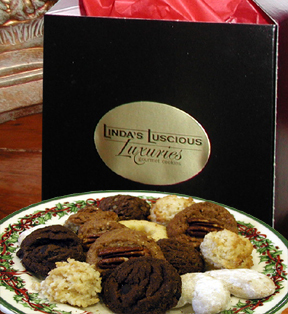 Linda's Gourmet Cookies started on a whim to see if we could turn a family Christmas tradition into a business. After eleven years of fun, work, great clients and much deliberation, we have decided to end our business adventure. 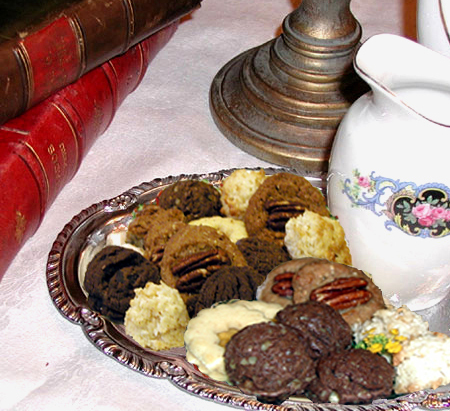 Linda's Gourmet Cookies has been sustained over the years by you, our loyal customers and kind words of praise, enjoyment and encouragement along the way. Knowing we will not be there for you or have you as a client makes this message difficult to write and send. But, life and circumstances change. Last year brought a 'milestone' birthday and two near death experiences. The first was a high speed, head on crash when an oncoming car turned left in front of my path at the last minute on a two lane country highway. The second came after a long deliberated ankle surgery resulted in pulmonary embolisms and a serious infection. These things reminded me of my mortality and the always present list of 'things I always wanted to do'. Therefore, we have decided to move on from 'the cookie business' and make sure all those things we wanted to do get done. As clients, you have made our experience the best it could possibly have been. We can't say how very much we appreciate you. We wish you much joy and happiness and hope that you too are able to do everything you've always wanted to do in your life. Christmas Cookie Gifts, Corporate Cookie Gifts delivered, Christmas Cookie Gift Baskets, cookie gift bouquet ideas, sympathy cookie gifts delivered.